A thick concoction of milk, buttermilk, ragi flour and sugar, ragi java is an Indian breakfast food similar to oatmeal. Ragi flour is made from millet, which is a nutritious grain that supplies a wealth of key vitamins and minerals. The addition of milk and buttermilk further increases the nutritional value, while the sugar isn't nutritious at all. Ragi, a gluten-free grain also known as millet flour or finger millet, has 111 calories per 1/4 cup. Millet flour is a good source of fiber with about 1 gram per 1/4-cup serving. Fiber promotes a healthy digestive system. 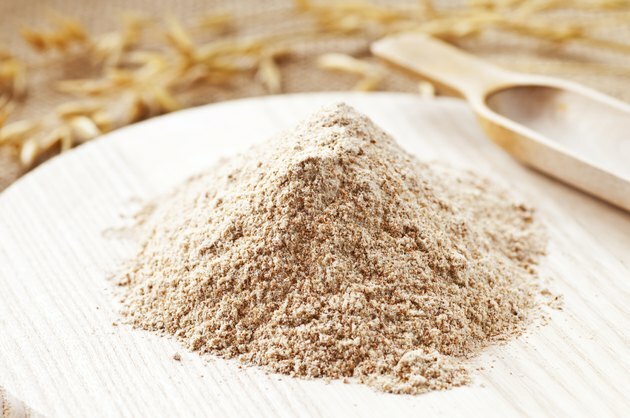 Millet flour also supplies phosphorus, a nutrient that helps maintain strong bones. Millet flour also supplies small amounts of folate, iron, magnesium, zinc and niacin. Both milk and buttermilk supply a good amount of calcium, a mineral that promotes strong bones and teeth. A 1/2-cup serving of 2 percent milk supplies about 150 milligrams of calcium, which is 15 percent of the 1,000 milligrams adults need each day. A 1/2-cup serving of buttermilk has 175 milligrams of calcium. Milk and buttermilk also supply phosphorus and vitamin A, though they each also contain sodium. Half a cup of milk has 61 calories and about 2.5 grams of fat and 1/2 cup of buttermilk contains 69 calories and about 2.5 grams of fat. The addition of sugar to a serving of ragi java decreases the nutritional value somewhat. A teaspoon of granulated sugar doesn't contain any fat, but it does have 16 calories. Sugar doesn't add anything in the way of essential vitamins and minerals, which means these calories are worthless. Sugar does enhance the flavor of ragi java, but too much sugar raises your risk of unhealthy weight gain. Being too heavy raises your risk of heart disease and Type 2 diabetes, the American Heart Association notes. If you're female, you shouldn't have more than 6 teaspoons of sugar per day and if you're male, you shouldn't have more than 9 teaspoons a day, the AHA recommends. A serving of ragi java made with a 1/4 cup of millet flour, 1/2 cup of 2 percent milk, 1/2 cup of reduced-fat buttermilk and 2 teaspoons of sugar contains 273 calories and about 6.25 grams of fat, of which about 3 grams are saturated. You'll get slightly more than one-third of the calcium you need for the day, as well as about 12 grams of protein. What Are the Health Benefits of Creme Fraiche?